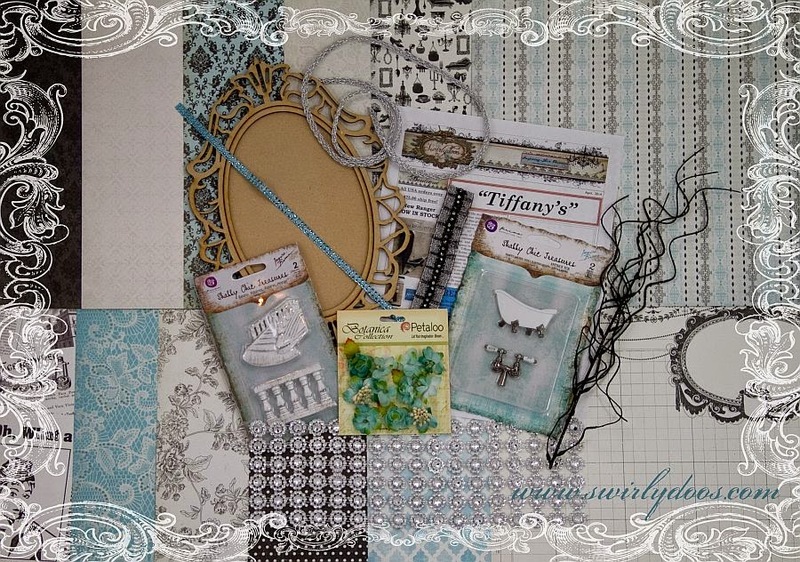 Scrapping Fancy: Swirlydoos April Reveal and Blog Hop! Swirlydoos April Reveal and Blog Hop! If you came here from Tracey's blog, then you are on the right track. If not, go back to Swirlydoos' blog and start from there. We have some amazing projects for you to see today !! Make sure to leave a comment on all of the blogs for a chance to win!!! Make sure you have LIKED & FOLLOWED Swirlydoos on Facebook!!! Seriously, my heart just stopped when I first saw this paper collection from Authentique at the Winter CHA show. The colors speak to me. The designs on the papers are so classically gorgeous, and perfect in every way. Tiffany blue is my favorite color! Breakfast at Tiffany's is my FAVORITE classic movie EVER! So, I was thrilled that we were able to get this collection in a kit, not to mention the perfect timing of this paper release- it's amazing how many embellishments coordinate with this paper and theme! Everything on this page is from the Tiffany's collection with the exception of the title, which are Authentique diction, and some Thickers. So, this is my card I am submitting for the Swirlydoos Round Robin card challenge this month for week one. I was going for a heavily layered, shabby chic card. I used a Die~Namites die (Butterfly Frame) for the oval. It is one of my favorites! Oh, how I love Audrey Hepburn! I've seen most, if not all of her movies. I came across this photo by Angus McBean while trying to find a good photo of this icon, and I found this, and KNEW this would be the perfect photo to pay tribute to my favorite actress! I used the embossing powder and metallic paint to create that finish on the frame. I used a metal corner, butterfly, and pocket watch from my stash to complete the layout. Thanks for joining us for our blog hop today. I hope you found some inspiration! My special word is : POSSIBLE! This concludes the blog hop! Please go back to the Swirlydoos blog and post the special phrase in the comments section for a chance to win one of our prizes! Jaw dropping gorgeous, Rae! Love how you've blinded out your projects! You are a master at OTP! So Rae, first of all I wand to steal your daughter, she is too cute for words!!!!!! The perfect kit for you! I especially love your original take on the chandelier and that gorgous shadow box! Such a terrific creation. I love how you have added the embellishments.. It has the perfect flow of pretty Nice way to use the dies. 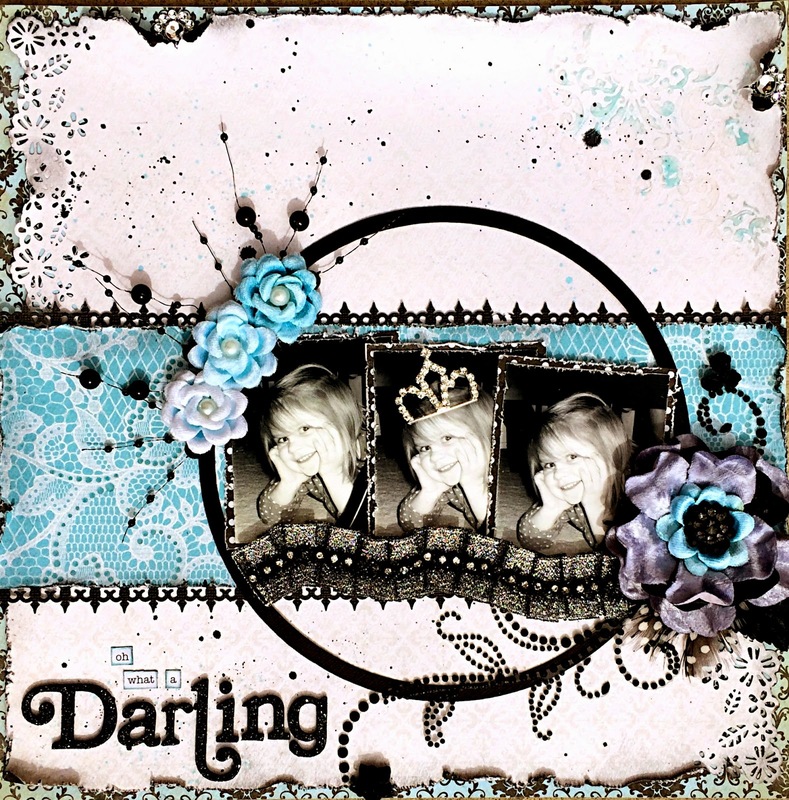 Stopping by from Swirlydoos Blog Hop. The shadow box is beautiful. Love the bright blue flowers and the black corset. The triptych is so pretty. love the crown (you know who's queen). thanks for sharing. Dang girl, you did it again!!! I sooooo love every project you made with this kit. Amazing job!!! Everything is absolutely GORGEOUS! Love the shadow box! 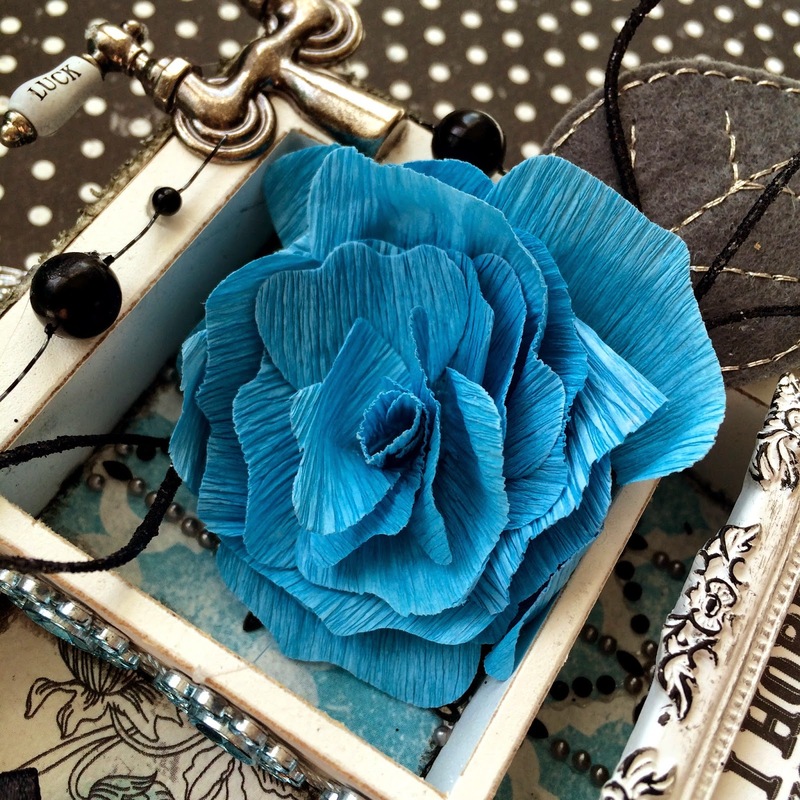 I can't wait to receive my flower tool so I can get started making some of these flowers! Rae, everything you create is so beautiful and inspiring. LOVE the altered shadowbox. I may have to make something similar for my own bathroom! Great idea! Off to watch your video! Stunning projects! I love your frame on your last layout! Love what you did with the corset! Wonderful work!! Out of this world gorgeous. I love Audrey Hepburn too! This is a fabulous pic of her and the layout is gorgeous! these are all very awesome Rea, what a great hop!!! I loved it all. Gorgeous projects! Can't wait to watch the flower tutorial. Rae, I love your work. Thanks for the video! Gorgeous! You had me saying, "now, why didn't I think of that?!" when I saw that lovely chandelier cut in half (now I can use it twice!). Beautiful work!! My goodness! That painters tray is Devine! I had decided that would be my favorite right away....till I saw your Supreme layout...OMG! Stunning! I'm in love with it all!!! 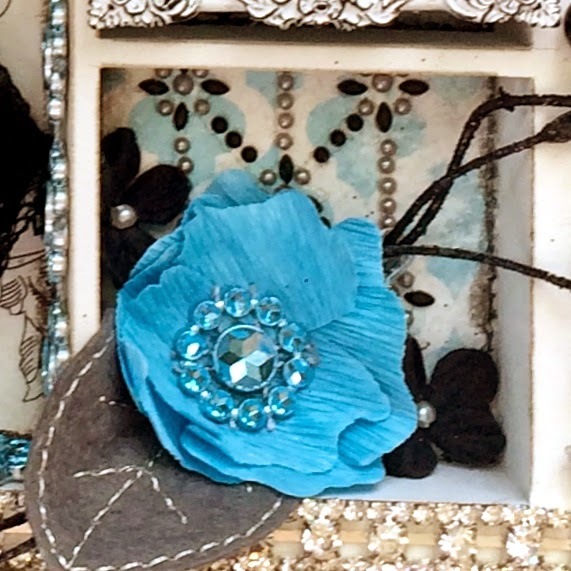 Oh my Goodness I love love the altered shadow box! Beautiful projects! Oh that altered box, so cute! I wish you would mail it straight to my house! You take the cake for this kit, such gorgeous projects! 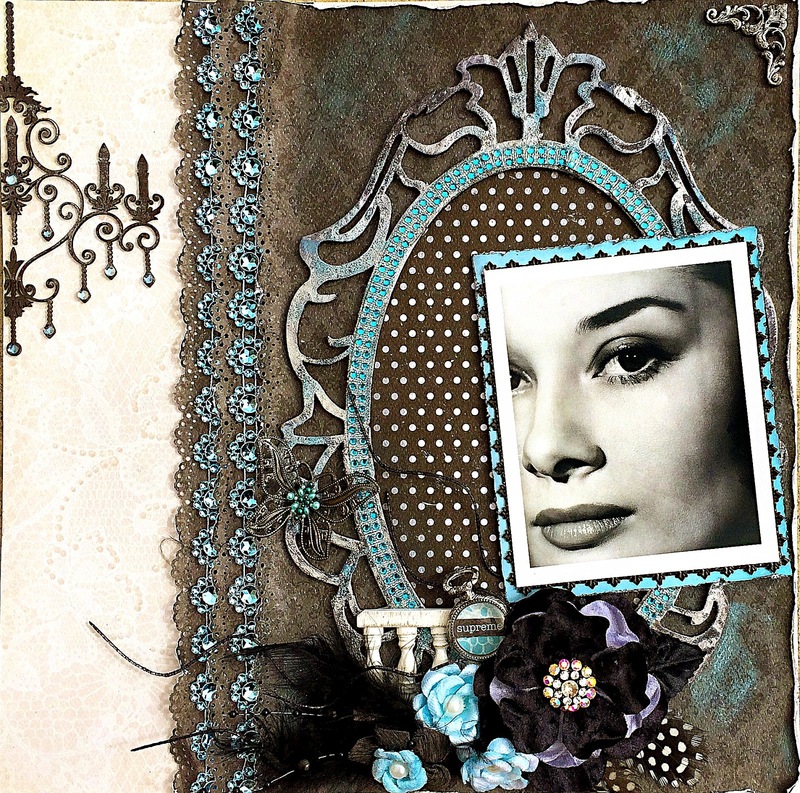 Your creations this month are amazing...I love the shadowbox and everything else you've made. I love how you have designed everything with this month's kit and beautiful colors! Oh wow! The Darling layout is amazing, and your little girl is adorable beyond words. Loved the fabulous card, that lace banner was great and I think your flowers are stunning. In fact as I was looking at them before reading I was wondering where you got them! What a fantastic shadowbox; and your card is so pretty. Loving your page. I really like the theme blues and black in your creations, so soothing. Thank you for sharing your flower tutorial - such fabulous blooms. What a fun shadowbox. Thanks for providing a tut for the flower. Beautiful layouts. I love the black and white with the Tiffany blue. Absolutely stunning. So much amazing inspiration this month. Oh my goodness. I love every one of these. How beautiful is your work, I will be back to visit again. Great layouts. I absolutely love that bustier! I love your shadow box! It will look beautiful in your bathroom. Thanks for the tutorial on the flowers! I am going to come back & watch it again. stunning as always! Rae, you are so talented! Rae, you always amaze me with your work. I just know that you are not offended when I use your ideas. Fantastic work. I love them all but I am especially impressed with the Audrey Hepburn layout. I think you have captured her "royal" aura. I know she wasn't from a royal family but she always seemed like a beautiful queen to me. Great job. These are all stunning. I cant pick a favorite. Thank you for the flower tut link. Dang, I love that shadowbox!!!!! 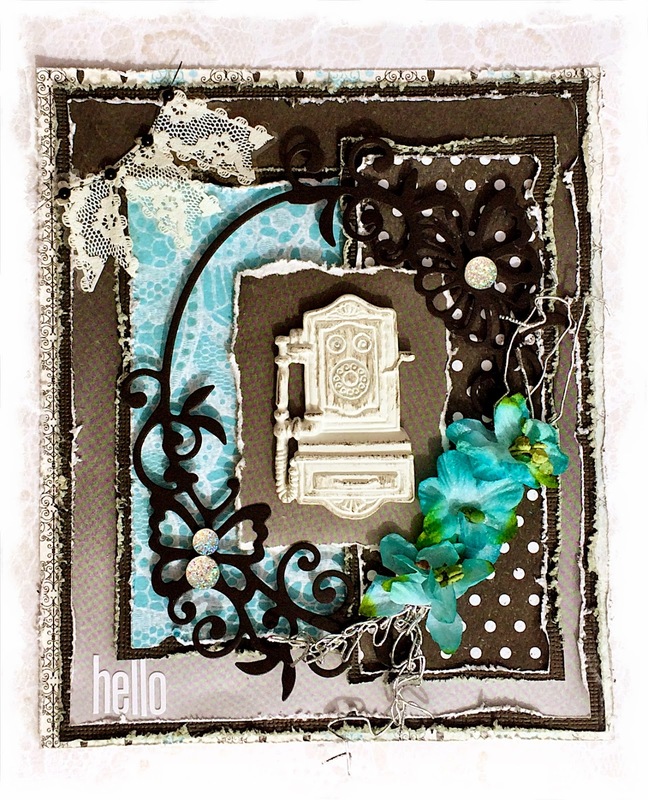 AND your Audra page (such a cute photo) AND you card; the phone resin is such a great idea!!!!! I am constantly amazed by the lovely works of art you and the other women create! Thanks for helping us get inspired too! Your projects are absolutely gorgeous! I love the colors and layering. Thanks for sharing. Wow, all were so stunning, the altered shadow box was sooo much fun! You were right. That is a perfect picture. Love your designs. Thank you for the inspiration.